Boost both the efficiency and productivity of your workgroup by adding a Color LaserJet Enterprise M577f All-in-One Laser Printer from HP to your workspace. This all-in-one unit not only offers standard printing, scanning, copying, and fax capabilities, but combines it with intuitive controls and superb security. On the printer side, the unit is quite capable, creating full color documents at a rate of up to 40 ppm in both simplex and duplex modes. Along with this, the M577f can leverage a maximum print resolution of 1200 x 1200 dpi in order to render fine lines on documents ranging in size from 3 x 5" to 8.5 x 14". Scanning, copying, and faxing are possible through the inclusion of an 8.5 x 14" flatbed, or the 100-sheet ADF. The flatbed will handle many jobs with ease and produce finely detailed 600 dpi images while the ADF benefits from fast scan speeds of up to 45 ppm in simplex or single-pass two-sided scans. Also, it has both a 100-sheet multipurpose tray and a 500-sheet standard input tray to handle multiple media types at once. On top of this, a convenience stapler is available for jobs that require it. User friendly, the M577f is equipped with a large 8.0" touchscreen LCD in order to change settings and quickly check status. It is well connected with simple USB 2.0 and Ethernet options. 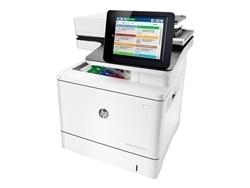 Additionally, the printer is durable, with a rated monthly duty cycle of 80,000 pages.